The Levana Lila Digital Baby Video Monitor is certainly a parent’s most trusted ally, as it allows you to always keep an eye on your child, without worrying about what the little one might be doing when you are not around. Levana Lila Baby Video Monitor comes with a plethora of useful features and functions, from the invisible and energy-efficient LED system embedded in this digital video baby monitoring device to the two-way communication system that allows you to both listen to your toddler, and talk to him whenever he needs to be calmed down. Besides this, Levana Lila Baby Video Monitor also has a night vision system integrated in it that allows you to see the baby from a distance of up to 12 feet away. That being said, you ca now monitor your child quickly and effortlessly on a 24/7 basis, thanks to this digital video baby monitoring system! You can also check out a review of the Infant Optics dxr-5 if you are looking for if you are looking for the current market best seller. This review will offer you an unbiased overview of the main features, pros and cons of this system, along with a bottom line. The prolonged, six hours of continuous battery life is undoubtedly one of the device’s most important benefits – as a matter of fact, this monitoring system for toddlers has one of the most lasting battery lives on the market. With a high-quality, durable and trustworthy rechargeable lithium ion battery, you can rest assured knowing that the system will never let you down when you need it the most! Besides this, it also comes with a good power save mode that allows you to triple the battery life of the camera! Another important benefit in addition to the extensive battery night and the built-in LED night vision is the unbreakable Clear Vu digital signal technology, which offers clear and impeccable digital signals to a maximum distance of up to 500 feet away. This aspect is particularly important for parents who live in large mansions, as Levana Lila Baby Video Monitor not only has a long-range action, but it can also operate on a 100% secure, private and interference-free digital signal. You are the only one who has access to that private signal, and you can always monitor your baby’s activity thanks to the 2.4-inch wide display that can reproduce real-time images with a rate of up to 25 frames per second. Another important advantage that parents seem to be thrilled about when it comes to Levana Lila Baby Video Monitor is the fact that the system is fully expandable and adjustable, as you can add up to three extra cameras to it. The system also comes with an easy to adjust wall mount system! 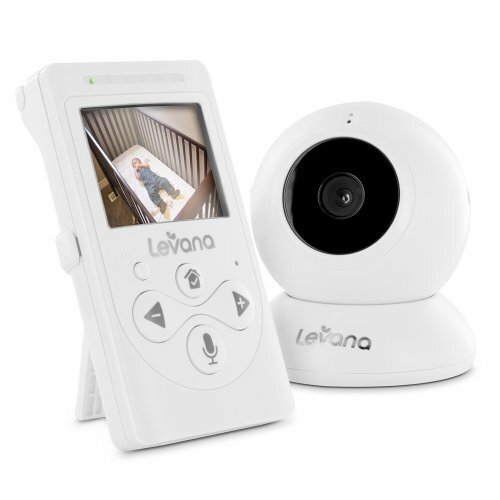 Levana Lila Baby Video Monitor does seem to come with some disadvantages, according to some parent reviews – sometimes, they have a difficult time getting signal during the night, and the night vision is far from being as clear as the manufacturer claims. Also, some users claim that the battery does not last for 6 hours, and there is always a bothersome sound that comes through the two-way communication system. Overall, the Levana Lila Baby Video Monitor is an average surveillance system for children that comes with an affordable price tag and that encompasses most of the basic features you would expect to find in such a system these days.